Welcome back. This is the third installment of: “Keep a 5 year Journal.” Click here to see all 12 months. I had family in town, my life got chaotic and I battled with some depression this month. I didn’t want to do art – of any kind. Some days I chugged through and wrote answers on a slip of paper just to write something, and – hey – this is my life right now why not document the ‘bad.’ Other days I didn’t write anything. I’ve got excuses – I forgot there was baseball practice, I forgot the other kid had piano, too. I got sick and had company visit. It’s all OK. This is YOUR project. The questions are made to be different and help you when you fall behind. The last book you read on Monday most likely will be the last book you read on Wednesday (OK, maybe not my bookworm friends but for some of us it doesn’t change within a day or two.. nor does your favorite color or movie, etc. ). So do what you can, when you can, and when you fall behind, make a plan to catch up, and that’s that! My approach to the journal is to make 365 “question” cards with the question and some art on the front and the 5 years of answers on the back. So here’s my favorite card I’ve made this time around. 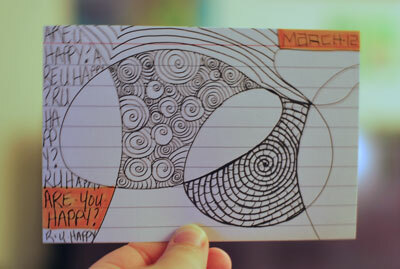 I really enjoy doing zentangles and doodling. Even more so, I liked the idea of leaving some spaces open to fill in the upcoming years. Then I can even start coloring them – the art doesn’t have to stop! I would really love to feature your five year journal here, please share links to it in the comments to be featured in next month’s column! For the newbies – I hope you join me on this journey. You can jump in at any time: start on your birthday, a special event or just make today special. If you decide to keep a five year journal, or are already keeping one and would like to be featured in an upcoming month, please contact me. I’d love to share what everyone is doing. I’d love to share all kinds of journals, so if you’re keeping it digitally I’d love a screen shot of your journal for next month. Thanks Tami for the April prompts…really enjoying this project and decorating the fronts of the cards. Totally random.. sometimes paint, could be papers, ephemera, or really anything that is close to hand. Like that these are a work in progress and if I miss a day or two it’s easy and quick to catch up. Love that I can decorate the cards when ever I like too. More often or not I do these when listening to scrapping podcasts like the Digi Show and PaperClipping Round Table. That’s such a great idea to do it while listening to Paperclipping. I tend to do mine while watching TV. I love that everyone makes it work for their life. Hi, Tammy. Thanks for sharing this project, I’m taking it since january. I’m doing it in a Moleskine notebook and I’ve created a special cover for it. I’m using half page for each day and I intend to make some art at the beginning of every month (but I didn’t have time for that yet). Hope you like my cover and thank you again for inspiring us. 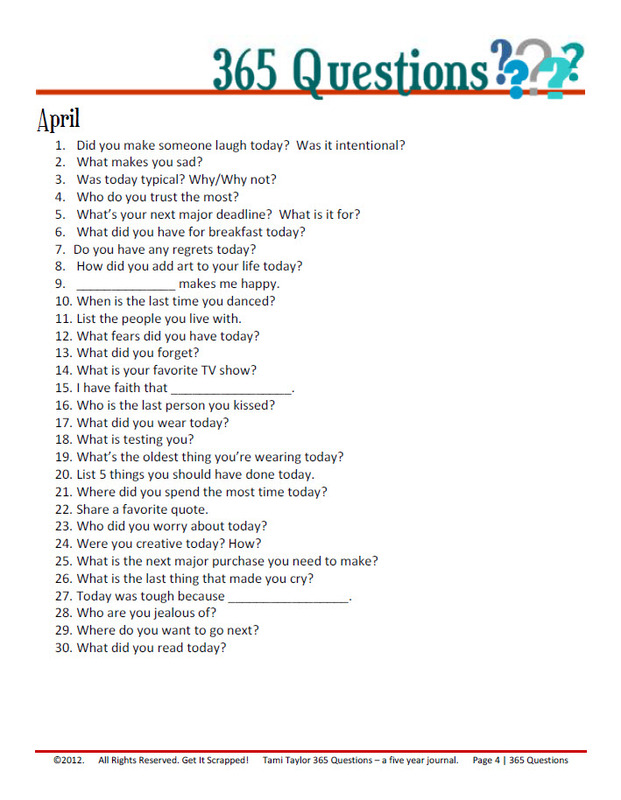 Will you be posting the prompts for May and the other months? I keep checking back hoping to continue with my journal. Is there going to be a list for June through the end of the year?? Or maybe there already is…if so where can I find them? Thanks!